I don’t know about you, but I always seem to have a song running through my head. My brain is like a continuous jukebox that’s always on infinite loop, and the same song will play over and over again. Sometimes it’s a tune I might have heard at some time during the previous day; it can even be something that was the backing track for a TV commercial. This is most prevalent at night, when insomnia has me lying awake, praying to God to just let me sleep for an hour. An hour — is that too much to ask? I don’t think so. During the night the songs are louder than bombs; it’s like someone turned my brain up to eleven. It’s especially deafening right before I arise. While some might find this maddening, to me it’s not necessarily a bad thing, because it keeps me constantly entertained. Fortunately it’s usually a very cool song, and not Celine Dion warbling something about her heart going on or some other treacly crap. But as I don’t own any Celine Dion albums, and the only place I might hear that song is in an elevator or a dentist’s office, that’s not usually a problem. This morning’s song-du-jour was Aerosmith’s “The Girl Keeps Coming Apart” from their 1987 album “Permanent Vacation,” four minutes and thirteen seconds of glorious, ear-splitting, balls-to-the-wall rock ‘n’ roll. It’s the type of song I’d usually listen to while doing bench presses, and not at 6 AM when I’m trying to revive myself after a night of non-sleep. Still, it’s a corker. In it, Aerosmith are on fire. The rhythm section drives a beat that’s like a racehorse on steroids, a horn section blares away, Brad Whitford lays down a bottom that’s thick as mud and Joe Perry goes off on a guitar solo that’s so hot that the speakers actually start to sweat. All the while Steven Tyler is flapping his prodigious lips about a gal you probably would not take home to momma. And with lyrics like “She’s like a call girl, Loose ends and all girl, but the girl keeps coming apart,” you can probably guess why. But then again, it’s an Aerosmith song, and the girl who keeps coming apart is most likely not a PhD that Steven Tyler met at a Mensa convention. Why she keeps coming apart is never explained, but logic dictates that that’s probably irrelevant. All that has me thinking about Mr. Tyler and his recent stint as an American Idol judge. He sure is a perplexing fellow, isn’t he? For nearly forty years (!) he’s been one of the leading personalities in rock, even if he and his mates are now looking a little long in the teeth, maybe too long to keep singing about girls coming apart. 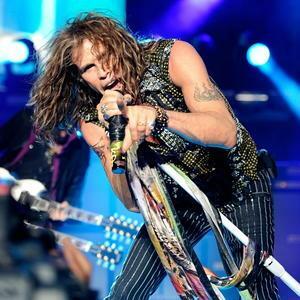 His life as a rocker is almost cliché, and he and Aerosmith have gone from dizzying, top-of-the-world highs to pathetic, drug-induced lows and back again. Tyler himself has been known to shoot from the hip, saying the most outrageous things, and anyone who has read his insightful and hilarious autobiography “Does The Noise In My Head Bother You?” knows that he has no off switch when it comes to expressing his opinions. Yet, as an American Idol judge, the man’s a cipher; he has absolutely nothing worthwhile to say. After a singer’s performance he’s more than likely to say something vague, like “We loved you since we first met you. You have the voice of an angel. Keep up the good work.” And that’s it. Nothing about being pitchy, nothing about sounding like a cat being passed through a wood chipper … nothing. When Jennifer Lopez offers more insightful criticism, you know that you really have nothing to say. Still, as talented as she is, J. Lo’s not the world’s best singer. And in new commercial for her fashion line now being sold at Kohl’s (that fine purveyor of top of the line, cutting-edge fashions), J. Lo’s voice is typically thin and reedy, and it’s being fed through a vocal decoder that makes her sound slightly robotic. The amazing dance routines and multiple wardrobe changes do their best, but ultimately they can’t mask the fact that the vocals are almost amateurishly bad. So I find it ironic that the spot runs multiple times during American Idol, since ostensibly the show is, you know, a singing competition. Uh-oh, I hope I didn’t just jinx myself. It will be terrible if J. Lo’s version of “I Got The Music In Me” runs through my head on infinite loop tonight, especially if it has me running out to Kohl’s in the middle of the night.